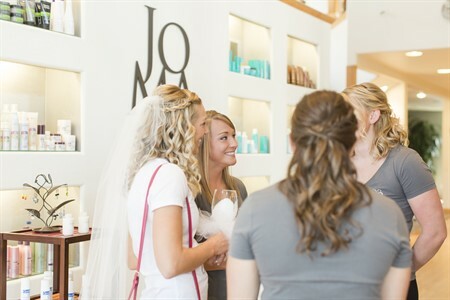 Jomaji Salon & Spa strides to provide relaxation and beauty to your wedding. On your special day, it is important for the bride and attendants to feel comfortable. 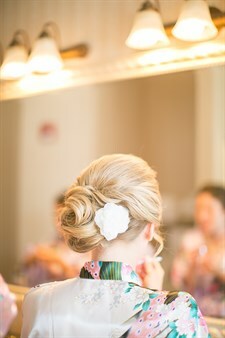 We suggest having everyone's hair and make up professionally done in order to ease time and frustration as well as create perfection in front of your guests and the camera. To reserve your day, all bridal parties must complete a wedding party contract. We schedule appointments for the bride, groom, attendants, family of the bride and groom, or anyone else you wish to include. 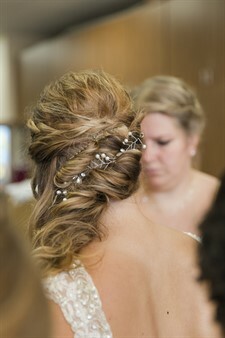 We offer hair, nail care, make up, and skin care services to complete the look you envisioned for your special day. All prices are starting quotes. Prices are based upon length and thickness of hair, as well as the time required for the chosen style. Prices are subject to change as styling needs change or services are added. Prices do not include gratuity. We accept all major credit cards with the exception of American Express. Prices subject to change without notice. See our service menu for more options. Please have every member of your party arrive 15 minutes before the scheduled appointment time. Please consider our guests who are scheduled after you. Please arrive for your appointment with completely dried hair. Wearing a button down shirt is suggested. Unfortunately, we do not allow alcohol on the premise, however, you may bring any non alcoholic refreshments. AND THE BEST PART..... HAVE THE TIME OF YOUR LIFE! Ongoing Special: Free Nail Polish! Check out the new polish colors we get in every month. With every Manicure and/or Pedicure, get a FREE polish! © 2019 Jomaji Salon and Spa, All Rights Reserved.